The Single Action Shooting Society Congratulates World Champions Spencer Hoglund and Randi Rogers. FOUNDERS RANCH, EDGEWOOD, NM. 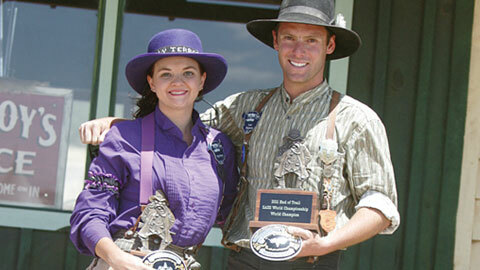 The 30th annual END of TRAIL World Championship of Cowboy Action Shooting and Wild West Jubilee was held June 19-26, 2011. END of TRAIL remains the Granddaddy of all Cowboy Action Shooting™ events. This year END of TRAIL offered 32 Cowboy Action Shooting™ categories in which World Championships were contested. Taking Top Overall honors to claim his third Overall Cowboy Action Shooting™ World Title was Spencer Hoglund aka Lead Dispencer, SASS #27115, from Chatsworth, California. Lead Dispencer hadn’t made it to END of TRAIL in several years, and he certainly made the best of his visit this year finishing 57 rank points ahead of his nearest competitor. Randi Rogers aka Holy Terror, SASS #15362, from Smyrna, Georgia finished as Top Lady and seventh place overall, winning the Cowgirl Category for her astonishing ninth World Championship in ten years! Holy Terror shoots on the Glock Team but has her shooting roots firmly planted in Cowboy Action Shooting™. Cowboy Action Shooting™ still remains the fastest growing of all shooting sports. With well over 90,000 members in the Single Action Shooting Society the sport has something to offer men, women, and juniors shooters of all ages. There are now over 600 clubs world wide in which to participate. Go to www.sassnet.com to find one near you. Previous articleThe Single Action Shooting Society Congratulates World Championship Winners Jim Finch, Terri Galpin, Chance Koch and Heather Kresser.